Entry Fee: $30 OHCA members, $40 non-members, for up to three pieces. Become a new OHCA member at the time of delivery and get your entry fee waived! Call or visit www.ohanloncenter.org for more details. Download a printable PDF of this notice. As the Fall Season approaches, we witness Nature changing her colors, presenting us with a abundant array of shades & textures. 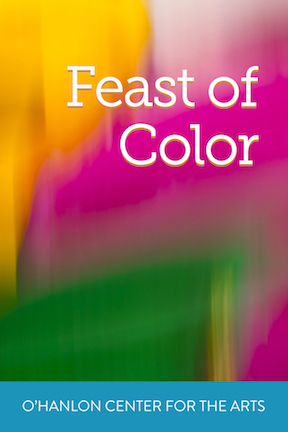 For our November 2018 “Feast of Color” exhibit, we invite Artists to submit their vibrantly colored works, in all media forms, including 3D/sculptural works. All artwork should represent color as its central focus, and ideally, transmit the artist’s regard for the color(s) used. Artwork may be a single color, or include boundless colors. Once the full exhibit is installed… it will be a true Feast of Color! Leslie Allen is an abstract painter, art teacher and cellist in Sausalito. She is represented by Seager/Gray Gallery in Mill Valley, and her prints are published by Art Brokers Inc in San Rafael. Since moving to her studio in the Industrial Center Building 30 years ago, Allen’s work has evolved from tightly-rendered still life and landscapes in watercolor, to fiercely expressive abstract and figurative paintings in oil and mixed media. In recent years she studied aquatints at Crown Point Press, and her later paintings and collages reflect her love of printmaking techniques. Allen has exhibited in many one-person and group shows, and her paintings are widely collected. Allen has served on a handful of art councils, boards and commissions, and she is a founding member of the vibrant ICB Artists Association. Her experience as an art juror includes two international art exhibits in recent years, and many local shows since the early ‘90s. Leslie Allen’s passion for color in art, music and life is undisputed, and her enthusiasm for painting is contagious.